Believed to bring luck and prosperity, our Blackeye Peas make a great gift for anyone you wish well. 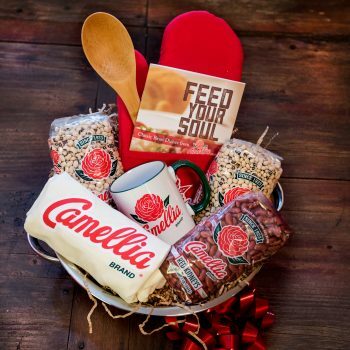 The Luck & Money Beans Gift Basket features three bags of Camellia Brand Blackeye Peas, as well as great Camellia branded merchandise for the kitchen, like our cookbook, apron, mug, and wooden spoon. Recipes including New Orleans-Style Blackeye Peas, Hoppin’ John, and Bessie’s Best New Year Blackeyes will set the lucky recipient on the right track.